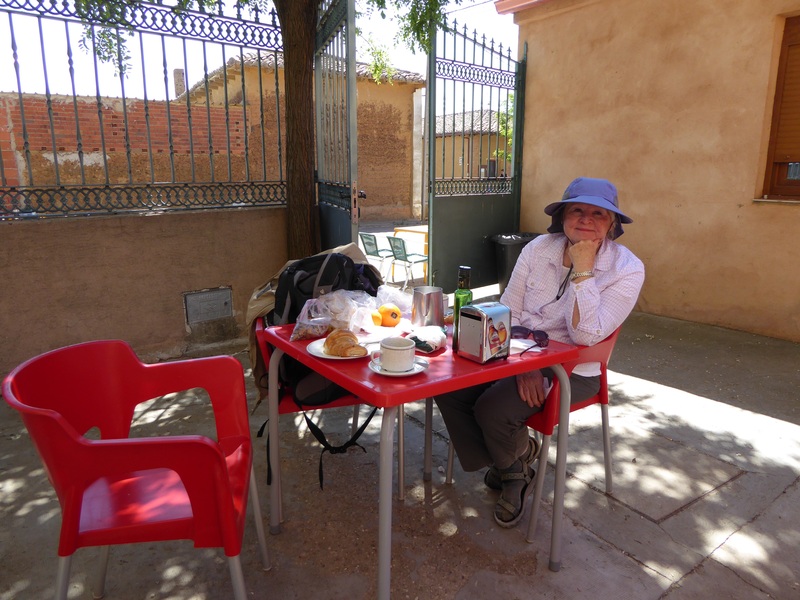 Being a Sunday morning before Mass, the town of Sahagun was still asleep when we were searching for a morning coffee to get us on our way. Rod helped a restauranteur put out his tables and chairs in exchange for brewing some coffee for us. We must have looked desperate. Fortified with our cafe con leches we departed passing a grove of poplar trees called “The Field of Charlemagne’s Lances”. Some historians believe Sahagun was founded by Charlemagne….. others do not….? Not far out of Sahagun, an extraordinary road for pilgrims has been built along the highway. This finely gravelled path runs for over 30 km and is banked on one side by alternating plantings of ash, maple and poplar trees. This makes for a safer walk but unfortunately the trees are too immature to provide much shade.yet. 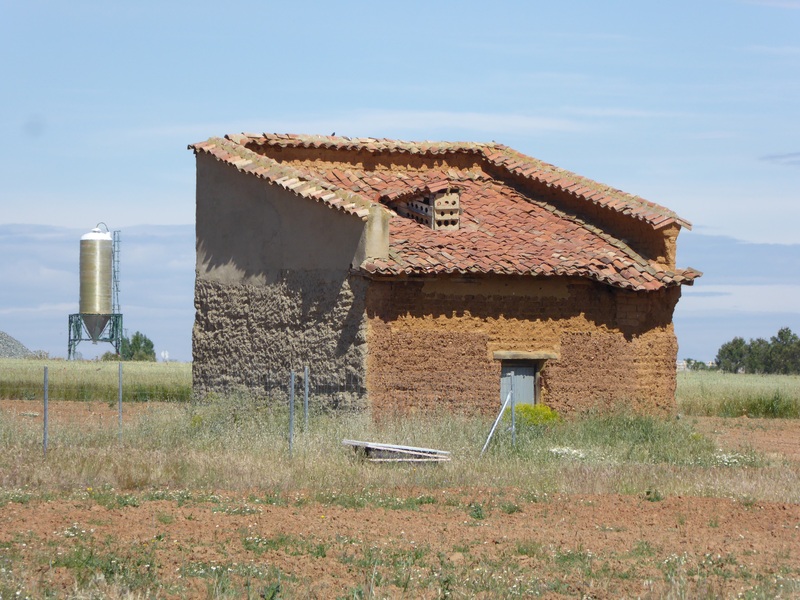 We are now into a drier portion of the Meseta but it is irrigated and the grain crops look healthy. 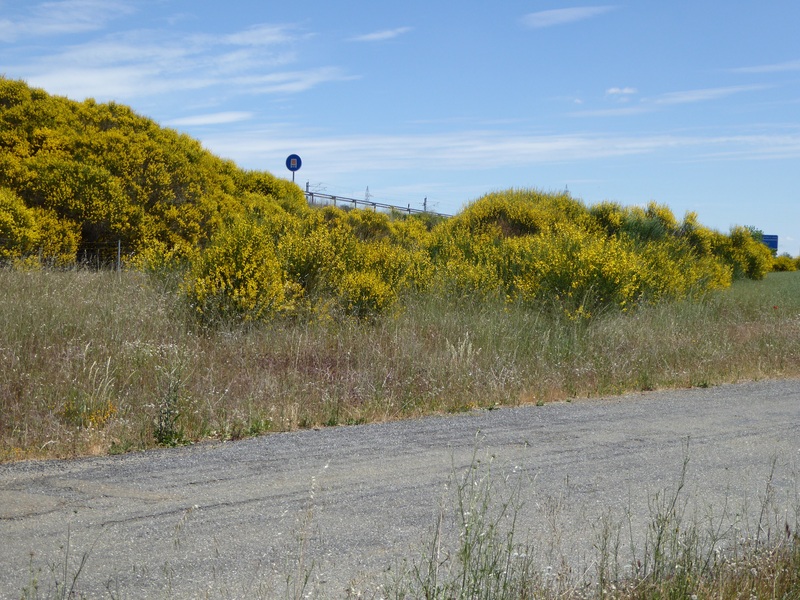 It seems the wildflowers that have so cheered our way are being replaced by broom. Even on the west coast we do not recall seeing such huge bushes of broom. As long as you don’t suffer from allergies, they look quite pretty and their perfume fills the air. In autumn storks congregate here before beginning their southward flight. Coming into town we saw a nesting stork at the top of some sort of tower. Our Irish friend was here to greet us and we are looking forward to having dinner with her. She is a wonderful raconteur. A few days ago on a lonely and sort of boring portion of the road, Delana was singing as we walked. Part of her repertoire was several verses of “It’s a Long Way to Tipperary”. That evening we met our friend, Marian who is from Tipperary! 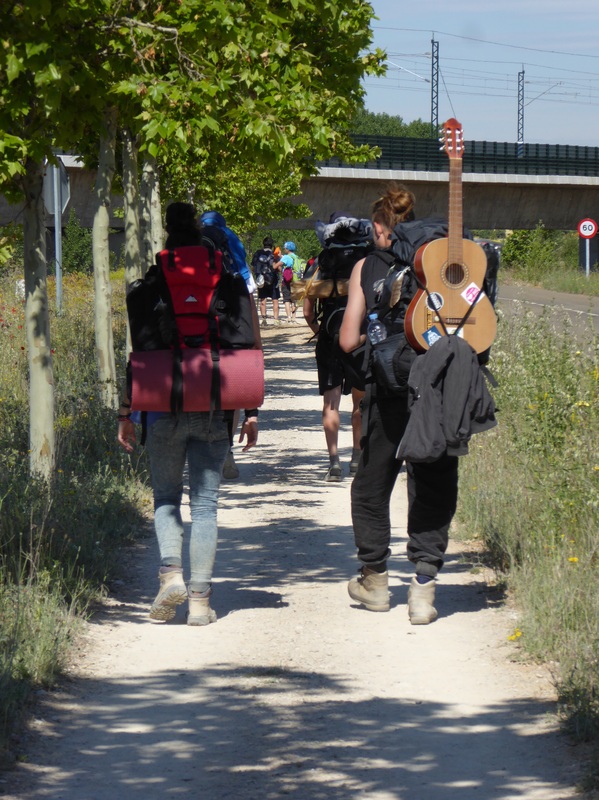 Ahhh….the Camino.and its magic. Kind of looks like I am coming out of a broom closet…. Bad pun! When you come to think of it, there aren’t too many ‘bad’ people who set out to walk 800 plus km with other pilgrims! Storks: unknown … They seem so just sit around most of the time! 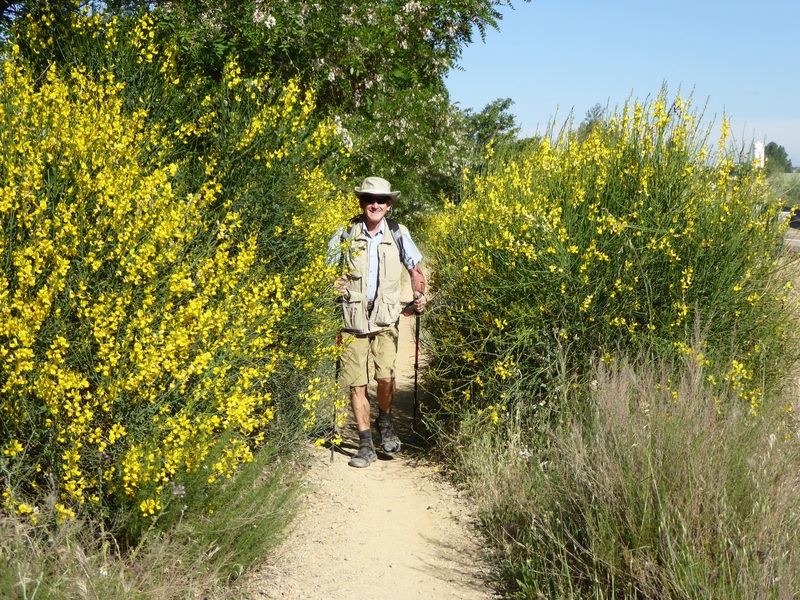 Anyone allergic to Broom cannot walk the Camino at this time of year,! Liked this – it shows the old with the new. That’s a centuries old adobe grain storage building with a modern stainless one in the background. A great lunch party was held fresh olives, cheese, local croissants, almonds and raisins. All good pilgrim stuff! This site is terrible, I have been working on it for almost three hours just to get the pictures and the narrative to go with each, in some kind of order. 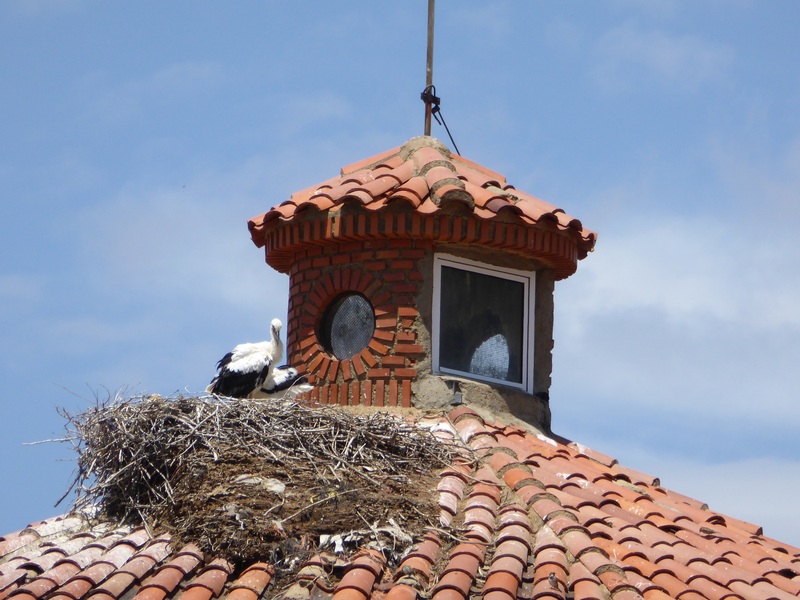 So why is the stork nest sitting atop a church steeple in the middle of the Camino stats??? Guess it really doesn’t matter does it… You will figure out that one stork registered…..
the stork is appropriate and well placed. Keep walking! Love the blog – I thought matching the photos to the comments was a little game to help us maintain memory power – just joking! The reality is the blog is like being along for the walk for a time, without the tired feet. Thank you for sharing your days with us.